Supercute Delilah! And I love the dimple too. i can do that. :) will you come thread my machine for me? You make that look so easy, Anna, I can come and show you how to thread your machine. 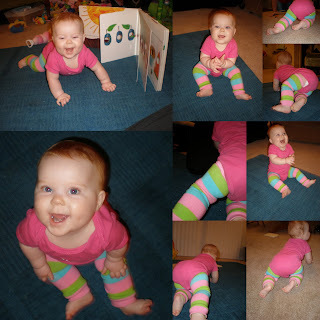 Delilah is so cute in her new leggings. You're so clever at this blog/instructional craft project thing. I must say that you WERE, in fact, trying to rub it in -- telling me about flipflops and shorts. I don't even remember what those contraptions look like. The winter wouldn't be so bad if I wasn't glued to my computer and not moving around at all. Blasted honor's thesis & grant writing BS (that does not stand for Bachelor of Science). Plus this super cheap apartment is super drafty and super badly insulated. And then Lukas wants to spend the summer in chilly Alaska. Why? Why not Hawaii or New Zealand? I'll never know.